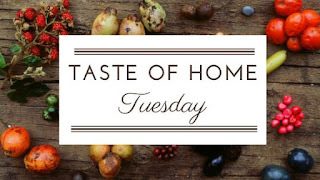 After another long hiatus I'm participating in this week's edition of Taste of Home Tuesday, as organized by Jolene from Jolene's Recipe Journal. 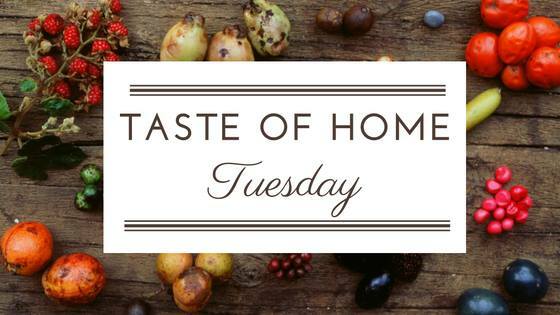 Be sure to check out the other recipes shared this week at the bottom of this post! I love when the cover recipe of a cooking magazine is something awesome. (Well, obviously it's always something awesome, or it wouldn't be on the cover). I guess what I mean is that I love when it's something awesome that I would actually make....immediately....as in pretty much when I get home. 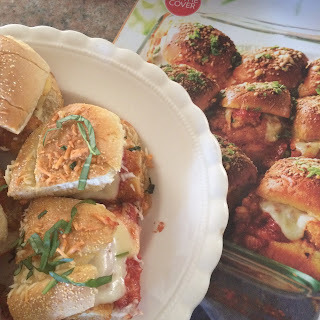 I really need to up my slider game, because there are so many amazing recipes out there for them. One of these is the cover recipe from the all new Taste of Home special edition titled "Make & Take", for the Chicken Parmesan Slider Bake. This magazine is such a great edition to pick up for all of the summer gatherings still to come. There are a lot of stunning looking and delicious sounding recipes! This one is no exception. What I really like about this recipe is its utilization of convenience foods. Yeah, I know.....that doesn't always equate to the healthiest of dishes, but life is about moderation. The great thing is that because this calls for many pre-made items, it can be thrown together in a hurry for a last minute invite that requires a tasty dish to share. Alternatively, if you would like to plan ahead, the ingredients are so basic that you could make them from scratch if you really want to knock this dish out of the park! I love making slider buns, and I often have my own sauce on hand and lots of chicken in the freezer. But, let's face it - sometimes we don't have the time for that. So, this dish is adaptable to just grabbing the ingredients, or creating this dish in a real gourmet fashion with lots of homemade ingredients. Perfect, right? I made the recipe exactly as stated, but omitted the red pepper flakes, and cut the butter slightly (I used 1/3 of a cup). I've never had luck finding Hawaiian sweet rolls here, so I used the alternative dinner rolls as suggested in the online version of this recipe. I've reproduced the recipe, below (noting my changes in italics). The original recipe can be found HERE. 1/2 cup butter, cubed I used 1/3 cup and found that to be just right. Preheat oven to 375°. Prepare chicken tenders according to package directions. Meanwhile, without separating rolls, cut horizontally in half; arrange roll bottoms in a greased 13x9-in. baking dish. Spread half of cheese slices over roll bottoms. Bake until cheese is melted, 3-5 minutes. Layer rolls with half of sauce, chicken tenders, remaining sauce and remaining cheese slices. Replace top halves of rolls. For topping, microwave butter, garlic powder and red pepper flakes, covered, on high, stirring occasionally, until butter is melted. Pour over rolls; sprinkle with Parmesan cheese. Bake, uncovered, until golden brown and heated through, 20-25 minutes. Sprinkle with basil before serving.